Let’s get one issue straightened out right away. As with many communities in New England, people struggle with how to pronounce the name. Well, Townshend is not near as hard to pronounce as some of those communities like Bangor, ME, Worchester, MA or better yet, Haverhill, MA (bet you won’t get that one right). Townshend, Vermont, is real easy. You can all pronounce “Vermont”, right? Townshend is pronounced, “Towns End”. Simple as that. Don't struggle with the “H”. Just say Townsend, VT and you have it . Now, those who are a part of “My Generation” would love to convince you that Townshend was named for Pete Townshend of The Who but that is way too easy to research. However, if you wish to spread the rumor, feel free to do so. It would make us old timers proud. You saw it on the Internet, it has to be true. The only Town in the world, that we know of, that is named for a classic rock and roller. Well, besides Joplin, MO anyway. This little space, in the world wide scheme of things, is to give residents and property owners a place to find current information, as well as past information, that is relevant to them. Much space is dedicated, or will be dedicated, to public documents as well as decisions that have an impact on those individuals. 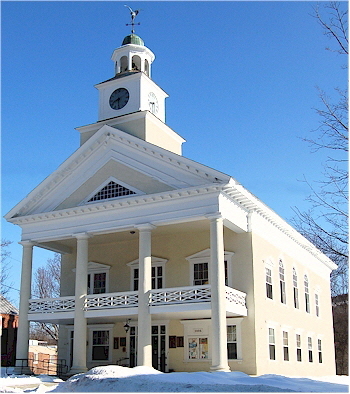 Secondary to that is information that the public at large may be interested in, especially visitors or potential visitors to this wonderful piece of Windham County, Vermont. The desire is to be as accurate and informative as possible, in all respects, so suggestions, as well as corrections, are more than welcome. However, suggestions will be weighed on a broad scale, what will be interesting to many, not just one or two particular individuals. The site, as it is presented, is far from “finished”. The goal, of course, is that it never be finished with new documents and new pages being uploaded as time goes by. Spend a bit of time here now and come back and visit a month or so from now. Time marches on and, with that, so does what is happening in Townshend. This resident can assure you that things are constantly changing and new challenges, like rounding up escaped emus, must be dealt with weekly, if not daily. Such is life in a small town in Vermont, any small town. THIS MONTH’S PRIMARY SPONSOR IS ERIK AND ANDREW’S PROPERTY MAINTENANCE. QUALITY WORK AT A GOOD PRICE. IT IS THAT TIME OF YEAR AGAIN. GIVE THEM A CALL AND GET A QUOTE ON SUMMER YARD WORK OR SPRING TIME CLEAN UP. WHEN YOU DO, BE SURE AND THANK THEM FOR THEIR SUPPORT.